The Butternut Snap Cookie is, I think, the companion biscuit to the Choc Ripple. It comes in the same sort of packaging, and is the same size and texture. Rather than cocoa, however, this biscuit is flavoured with coconut and golden syrup. It’s made with a good proportion of butter, giving it a rich, butterscotch flavour. However, it does share the Choc Ripple’s bizarre tendency to going stale within about two minutes. Not that they are unpleasant when they do so, however they quickly become rather less ‘Butternut Snap’ and rather more ‘Butternut Chew’. They dunk into tea rather well, changing to a slightly gooey, chewy richness. There’s not a lot more to say about them, really. I actually rather like them – they are a great everyday biscuit that hold up well against other more expensive varieties of ‘cookie’ that one sees sold in boxes. Why is it, by the way, that ‘luxury’ biscuits are sold in boxes? It seems to be a universal rule. In the UK, for example, the McVities Digestive is a very everyday biscuit, and is sold in a normal pack. However, McVities clearly saw an option to play on the heritage and ‘importedness’ of them in Australia, and they are sold here in a box (with a criminal price mark-up, I might add). Anyway, the Butternut Snap is very nice. Eight out of ten. It was a very exciting day the other day, as a friend gave me a present. A packet of biscuits. He had been visiting family in Adelaide, and, knowing my predilection for biscuits, brought back a pack of YoYos. The reason this was so exciting (other than the prospect of some biscuity goodness) is that YoYos are only available for sale in South Australia. They are a ‘regional line’, and baked especially for that local market. 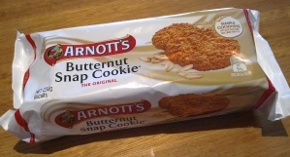 As such, it’s impossible to get these biscuits here in Sydney through the normal channels; indeed a special permit is required to carry them across state lines. Luckily my friend had filled out all the requisite paperwork and was allowed to bring these specimens back with him. The YoYo traces its roots back to the ‘Menz’ bakery, an iconic local producer of sweetmeats that was established by the Menz family in Adelaide in 1850. It’s not clear when the YoYo was first produced, but it was definitely in production by 1943, as this advert shows. (There is also a charming film of the Menz factory here; sadly the biscuit featured in the film is a morning coffee type, not a YoYo.) The Menz business became part of the Arnott’s group in 1964, amidst a wave of bakery mergers, and the Yo Yo survived the merger and is still in production today. There are lots of intriguing things about this biscuit. Firstly, it is the only Arnott’s line that does not feature the standard typography; the name ‘YoYo’ is shown in a block blue font outlined in red. To my eyes this looks a bit odd; however it is explained by the heritage aspect of this biscuit. This is the original YoYo logo, and as a ‘listed heritage design’ under South Australian laws Arnott’s are not allowed to change it. Secondly, each pack contains three different designs of biscuit. They are all the same shape, but are embossed with different patterns. The original design, I have discovered, had the word ‘Menz’ in the centre. This was changed to ‘YoYo’ when Arnott’s took over; presumably they changed it to ‘YoYo’ rather than ‘ARNOTT’ (as features on many other Arnott’s lines) both from space considerations, and also in order to not upset South Australian sensitivities that an iconic SA brand had been bought out by a NSW company. So what do they taste like? Well, they are actually rather good. They are made with a good proportion of butter (as well as vegetable oil), and are flavoured with honey. This makes them quite rich and sweet, although they are quite a light biscuit that is nice and airy. They dunk into tea extremely well (we used a robust Ceylon for this), and are very moreish. I’d give these a seven or maybe even an eight out of ten. So why does Arnott’s hide these gems down in South Australia, rather than giving them the wider distribution they deserve? Who knows; perhaps it’s all part of keeping South Australia special.